Tasty pancakes or the most worn cap in Sweden? Regardless of what comes to mind when thinking about Lantmännen, their expertise lies in sustainable food production, and taking responsibility from farm to table. FlexLink delivered an automated conveyor system that met Lantmännen’s needs of high flexibility, accessibility and excellent hygiene. Lantmännen is an agricultural cooperative, and northern Europe’s leading actor in agriculture, machine, bioenergy and food. The first central compound was founded in 1895, Lantmännen have businesses in about 20 countries’ and they are owned by 29 000 Swedish farmers. Lantmännen focuses on optimizing raw products, ingredients and processes to achieve the best quality of the final product. They do a lot of research on sustainable production, where processes that can create unique products and give an improved quality and durability are requested. With a base in cereals, they refine the farmlands’ resources for a viable agriculture. The company is founded on knowledge and values that have been present in their owners work for generations. By working with research, development and business throughout the whole value chain, Lantmännen takes responsibility from farm to table. Lantmännen wanted to merge two production units into one, to gain large synergy effects. Equipment from the old factory needed to be installed together with the existing equipment, without compromising on production flow and flexibility between freezers and packaging lines. 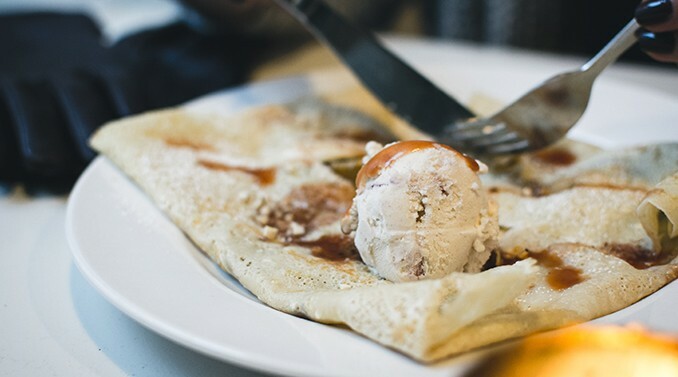 The products, which consisted of pancakes and crepes, were unpackaged and therefore fragile and could not be moved from the conveyors after they had begun their journey through the factory. Therefore, hygiene was a top priority for this project. 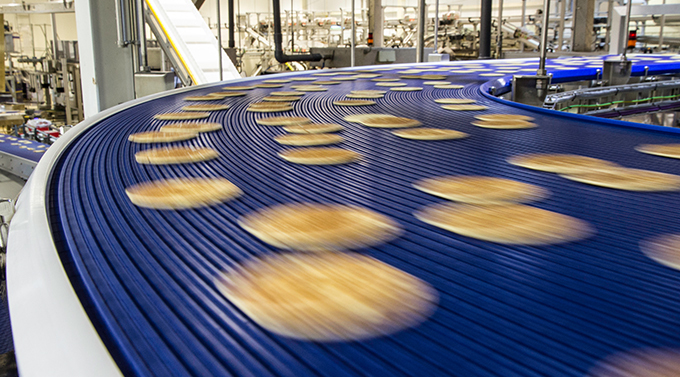 There was a high flow of pancakes moving around in the factory, so the equipment needed to handle the high flow of products and have high accessibility, to avoid waste. Due to the specific circumstances of merging two production units into one, they needed a supplier that could manufacture customized solutions. Another important factor was that the supplier had to manage the tight time schedule, for both moving the factory and to install the new equipment. FlexLink solved the lack of space by using the entire volume in the factory, by installing conveyors from floor to ceiling. Since the pancakes and crepes were unpacked and vulnerable it was of high importance that the handling of the products went smooth and friction-free. To ensure this, we did tests of the transition process from one conveyor to another. We conducted these tests at our own premises, to demonstrate the procedure for Lantmännen before we installed the solution. To meet Lantmännen’s need of excellent hygiene we installed our easy-to-clean wide belt conveyors in stainless steel. When we installed our automated production flow solution, Lantmännen took the opportunity and made some reconstructions in the new factory, and added new machines. That meant there were many suppliers and installations to consider and coordinate the work with. We had frequent meetings with Lantmännen to follow up the work, and on location we had both a project manager and a installation manager, that had a close dialogue with Lantmännen’s project manager. One challenge with this project was to make room for all the machines and conveyors in a limited space, and still deliver the required flexibility by connecting the fillers and packers according to Lantmännen’s needs. Another challenge was the short time frame. We had six weeks to finish the whole installation, and the production stood still for ten days. Due to close communication, detailed planning and problem solving, we managed to fulfill Lantmännen’s expectations. This investment has led to a factory that today produces double the volume without compromising on capacity, hygiene or flexibility. The factory has a high accessibility through robust and safe transport solutions, and the staff can vary products and packaging types in the same system using minimal conversion. Last, but definitely not least, the cleaning process has become both effective and safe, giving an even and satisfying result. With this investment, the future of Lantmännen and their pancakes looks brighter than ever! Did you found this article rewarding? 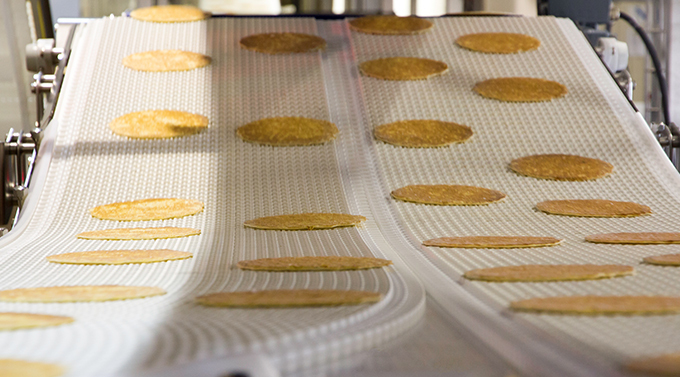 Do you want to know more about FlexLink’s automated conveyor systems? Please visit our website or contact me here for more information. 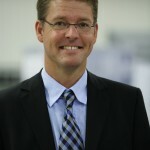 Fredrik Boberg is the General Manager at FlexLink, Sales Unit Nordic.